Paleontologists have discovered a new species of dinosaur in Australia – and it’s big. To the untrained eye, the new dino kind of looks like a Diplodocus, but it’s actually a whole new species called Savannasaurus elliottorum – or Wade, for short. The wide-hipped, long-necked, four-legged herbivore was about half the length of a basketball court, and its shoulders stood as high as the hoop. At least 14 metres (45 feet) from head-to-tail, Savannasaurus elliottorum was a barrel-chested member of the sauropod group, which includes the largest land animals to ever have roamed the planet. 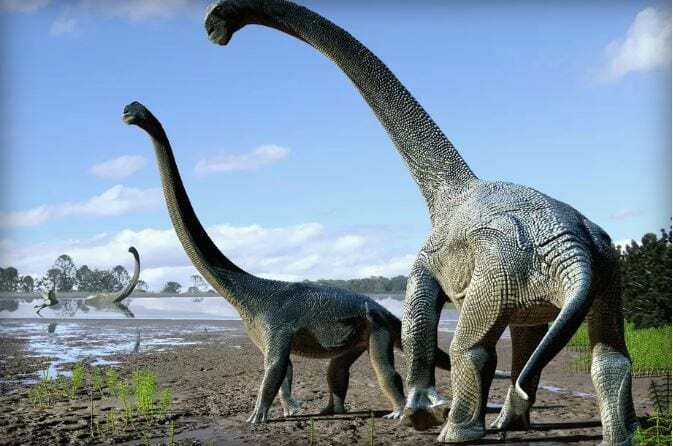 According to BBC Nature, the largest sauropod dinosaurs weighed close to 100 tonnes – ten times the record weight of a modern elephant. The new sauropod was found by David Elliott, who runs the Australian Age of Dinosaurs museum on his farm near Winton in Queensland. Palaeontologists nicknamed the two dinos Wade and Matilda, and both species are thought to be unique to Australia, the Guardian reports. But how and when these and other dinosaurs made it Down Under is still a source of ongoing debate.